Interviewing Robert Bowling was actually one of the hardest tasks I’ve undertaken as a journalist. Not because Robert was hard to interview – he’s one of the most down-to-earth, laid back, easiest people to talk to I’ve met in the industry to date – but because there was this huge elephant in the room that we weren’t really allowed to talk about! Multiplayer. The event was another chance for us to get our hands on Spec Ops Survival mode, as Activision aren’t ready for us to hear about Multiplayer just yet. That’s something they’re saving for a later date (more on that later). Fortunately though, Robert did throw in the odd hint and a multiplayer fact here and there. For those that aren’t aware, traditional Spec Ops mode will still be around in Modern Warfare 3. You’ll be able to play two player co-op on most of the campaign mode missions. Spec Ops Survival Mode takes a completely different approach. It will be a way for you and a friend (or stranger, for that matter) to jump onto any multiplayer map and kill waves of NPCs. We published a preview of Survival Mode last month. When asked about the Survival Mode/Multiplayer maps, Robert wouldn’t confirm that we’ll see a London based level, but hinted that we just might! With a bunch of old perks being removed from Multiplayer this time around, we’re going to see a host of new ones introduced in Modern Warfare 3. Obviously Robert couldn’t give me the new names just yet, but I’m sure the MW3 fans out there will be happy to hear that they’re going to have a whole bunch of new perks to play around with, in replacement of the older somewhat over-powered selection. Robert did confirm that Stopping Power, Danger Close, Juggernaut, One Man Army, Commando, Last Stand will be gone. Robert informed me that Infinity Ward are trying to work perks into Spec Ops Survival Mode gameplay itself too, because the cash-buy system means there’s no ‘create class’ option in this mode. We can already see this at work with the “last stand” perk. When a player is shot and “downed” in Spec Ops Survival Mode, they can still fire their pistol initially, in order to obtain revenge. Killing an enemy while downed the first time, will bring a player back to life, so to speak, and you’ll be back in the fight. When you get downed for a second time however, you’ll be reliant on your teammate to get you up, and if they fail, you die. Survival Mode features a brand new cash-based unlock system. Throughout the game players can buy weapons and upgrades from the Weapons Armory, and more weapons become available as you level up through the rank progression. Multiplayer will also be using an innovative new unlocking system. Something we haven’t seen yet. Obviously Robert couldn’t really go into detail, but he did say it’s completely seperate from the Spec Ops unlocking system, all-new, and won’t involve currency…which is interesting! Quick-scoping will not be taken out of the game. A fan-favourite from MW2 will remain in MW3, which I’m sure will please and offend many members of the community at the same time. There aren’t many features in the COD franchise that ignite such debate, but the Quick-scope is here to stay. For those curious, Robert says he can’t quick-scope himself. The highlight of the conversation for me, was the revalation that custom game modes will be supported in some way. While discussing quick-scoping, Robert confirmed he’s aware that players have adapted the game over time to include game types of their own, including things like quick-scope/no-scope, Mike Myers, and cops and robbers. Fourzerotwo mentioned that they appreciate players use the game in new and interesting ways that it wasnt necessarily designed for, and they want people to have fun with the game. He very nearly slipped up and spilled the beans on how exactly they’ll be handling custom game modes, but frustratingly managed to keep schtum. Even though Black Ops had a custom game mode feature, it’s something we’ve never seen in a Modern Warfare title before, so we’ll just have to wait and see with that one. While chatting about our favourite COD weapons, Robert did mention that the AK47 will still be a power weapon. The assault rifle of choice for day 1 MW2 players will still pack a punch. They’re still working on gun balancing at the moment, and clearly putting a lot of focus into it. Robert’s favourite gun in COD4 was the G36C, and in MW2 it is the SCAR (originally the TAR). Interestingly he doesn’t have a favourite in MW3 yet, but that’s probably down to the balancing. Fourzerotwo’s job role has changed a lot over the last few years. Originally Infinity Ward’s Community Manager, currently the Creative Strategist of the Modern Warfare franchise. When asked about his feelings on the transition from old IW to new, and his evolving position, Robert said he finds his work very rewarding, with COD4 being the first game he had real input in, and getting more involved in MW2 and MW3 respectively. Robert mentioned that whenever he has a night free to play games, he jumps on MW2. 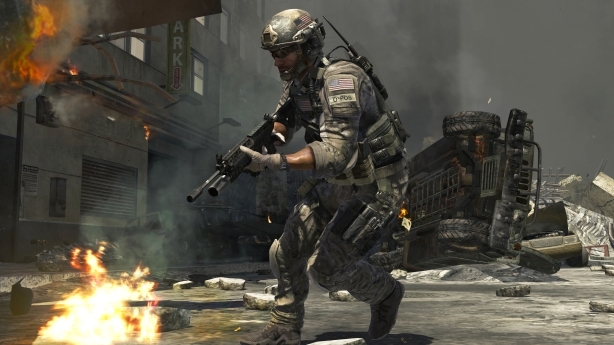 He still occasionally enjoys a game of COD4 – even more so lately, he mentions trying to re-capture that original Modern Warfare feeling, to help with towards the MW3 development. Robert has said on record a couple of times now, that he’s trying to take MW3 back to COD4 (gameplay-wise) and build upon that, in places that he feels IW went a little too far with MW2. 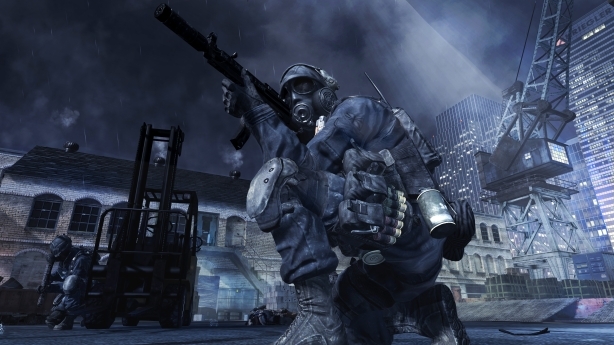 Robert says the focus for multiplayer gameplay in MW3 is on simplicity and balance, and that the multiplayer will once again be focusing on the individual player, in gun-on-gun combat, less so on the air strikes and other air backups. According to Robert, Infinity Ward used to playtest cross-studio, by competing with Treyarch in player matches. With Modern Warfare 3 though, there’s plenty of competition in-house between Infinity Ward and Sledgehammer. It’s good to know the IW/Treyarch competition was kept in-game. Saying that, I’ve played with David Vonderhaar, and I can’t imagine him giving them an easy time! I asked Robert when will the curtain will finally be drawn back on the Multiplayer aspects of MW3, you’ll be happy to know that date is September 2nd/3rd, during the COD XP event. And for those wondering; yes, Glen Schofield and Michael Condrey, Sledgehammer Co-Founders, are as crazy in real life as they appear on Twitter. Modern Warfare 3 is due out on November 8th, for Xbox 360, PC, and PlayStation 3.